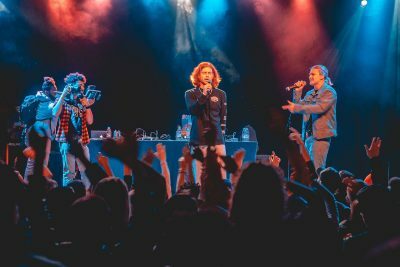 A student rapper and an on-campus hip-hop dance troupe will open for Aminé Friday night at Boston University’s spring concert, 802.1. Rapper Daniel Levitov, also known by his stage name Danny Diamonds, is a junior in the College of Communication and has more than 23,000 monthly listeners on Spotify. The hip-hop troupe, Fusion, has about 40 members and is the oldest dance team at the university. BU’s Student Government reviewed about 50 video submissions for opening acts, Student Body President Devin Harvin said. SG held auditions for about 15 performers, he said, before ultimately deciding on Diamonds and Fusion. “There’s a certain wow factor that connects all of them,” he said. The spring concert was put together because SG hoped to unite the student body, Harvin noted, with a different kind of event other than Splash or matriculation. Harvin said it’s uncommon to have a dance team open for a musical artist. Ina Joseph, Fusion’s assistant director and a junior in COM, said she wants to challenge people’s perceptions of a student dance team during the concert. She said Fusion will be pushing the boundaries of what they’ve done so far, as well as what is expected of them as a hip-hop urban dance group. “I don’t think we’ll be meeting people’s expectations by any means — in a good way,” she said. Joseph said she and other directors in the troupe have choreographed dance routines to some of Aminé’s songs in the past. She said she was one of the first team members to break the news to the team that they would be opening for Aminé. 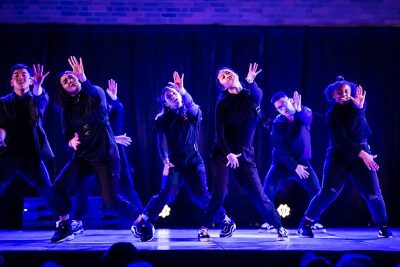 Fusion will perform their spring set at 802.1, Joseph said, which the troupe put on at their self-hosted “ELEMENTS XIX” last weekend. Fusion hosts this dance competition annually, in which dance teams from across the East Coast compete and take workshops with experts. Joseph said Fusion will improvise their performance according to the details of show’s set and schedule. The audition process for 802.1 was “fairly straightforward,” Joseph said. Fusion submitted an application and was then given an audition, for which they had 10 days to plan what they wanted to perform and to sort out the logistics. She said the group found out they would be opening on March 27, a week and a half before the show. Both Fusion and Diamonds said the Aminé concert will be different from shows they have done in the past. Diamonds, whose family immigrated to the United States from Russia, said the stage is a familiar place for him. He’s performed at venues such as The Sinclair last November, as well as a a gig with the group 99 Neighbors near the University of Vermont’s campus last September. Diamonds said he is excited for the Aminé show. Self-identifying as an alternative hip-hop artist, Diamonds said he started his career as a rapper nine years ago but started pursuing it seriously five years ago. In the last two to three years, he has released his songs on Apple Music and Spotify, he said. Diamonds said he believes one of his main strengths is songwriting and hopes his audience takes the time to really listen to and understand his lyrics. He said he aspires to write songs for big-name artists in the future. Diamonds said he is inspired by artists who have a “nerdy play style and the cockiness and uniqueness” of performers like “old Kanye” and Childish Gambino. When he’s not making music, Diamonds said he models for streetwear apparel brands and creates album covers. Like Fusion, he said, this will be the first time he opens for another artist.